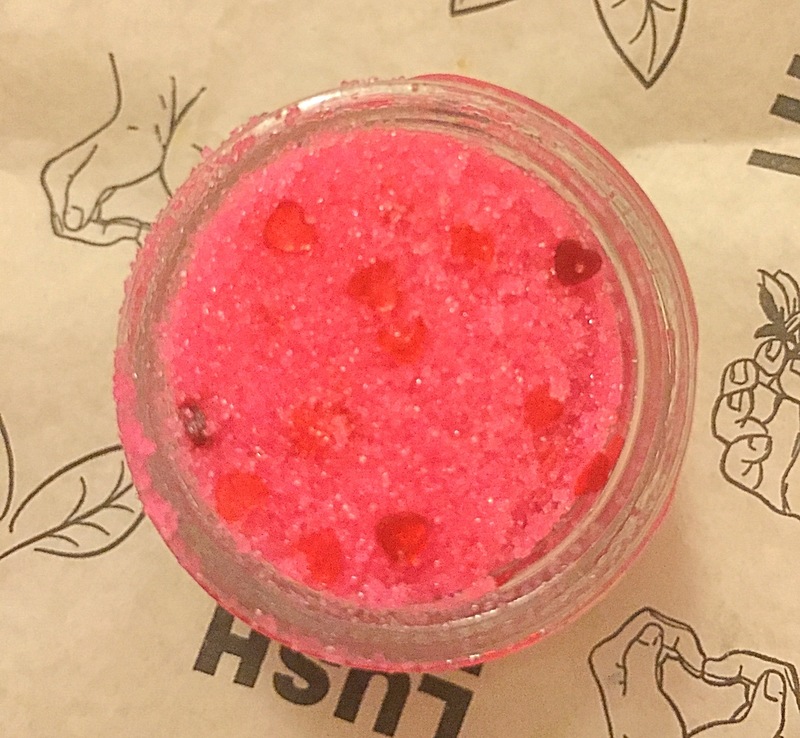 This valentines lip scrub first made its appearance last year but unfortunately I never managed to get hold of one. So I was very pleased to find it was making an appearance again this year (although changed very slightly) and made sure I put it at the top of my shopping list. Lip scrubs are a product that when I was younger, I didn’t tend to buy from lush as I saw them as quite expensive for what they where. But I now really appreciate these little pots and they are firmly part of my skincare routine. A lip scrub is designed to keep lips soft and smooth. Made predominantly from sugar they work in the same way as a face scrub does , scrubbing away dead skin to leave your lips feeling silky soft. Lip scrubs also contain a good helping of cocoa butter which helps to moisturise the lips. 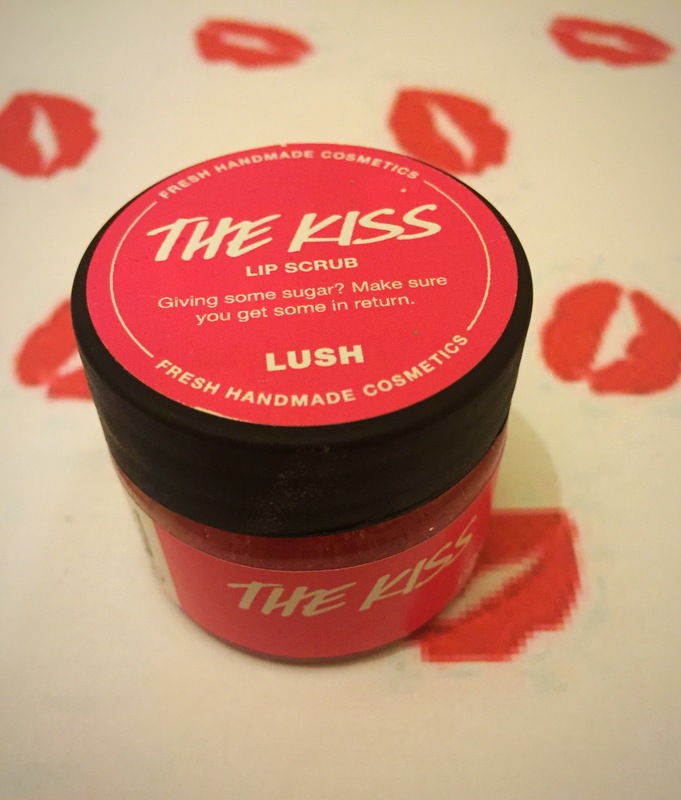 I think that the kiss lip scrub is possibly one of the cutest looking lip scrubs that lush produce. Firstly the colour of the scrub is just devine. It is a beautiful bright pink colour and it topped with little edible hearts (perfect for Valentine’s Day). 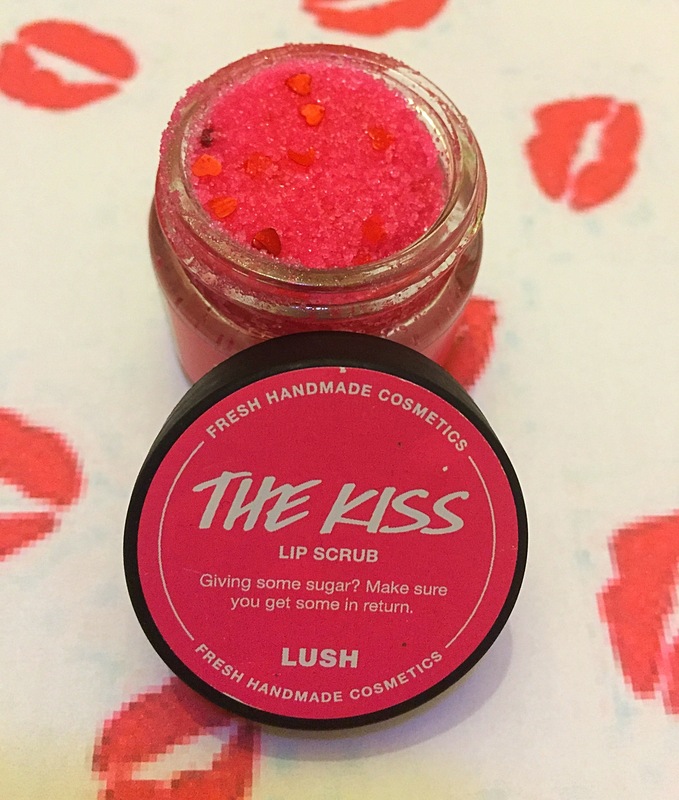 I really do love the scent of the kiss lip scrub, I actually think it is my favourite scent out of all of the scrubs. The scent of this lip scrub is extremely sweet and sherbets and it really remind me of love heart sweets. To use the lip scrub all you have to do is scoop a little out with you finger and rub onto the lips. you can then either lick it off your lips (yes it’s entirely edible) or wash it off. I usually love licking my lip scrub off due to the fact that its main ingredient is sugar they have a very sweet taste. However I really don’t like the taste of the kiss! it seems to have a very high salt content as well as the sugar and due to this it seems to taste very salty and not of the sweet taste I was expecting. I personally feel the salty taste is not very pleasant and it very hard to scrub your lips without tasting it. Overall I love the concept of this product and I adore the scent but I really feel that the taste lets this product down. Due to the taste I probably wouldn’t purchase this item again which is a shame as it smells so good. It looks so cute! I’d love to give it a try! What are the little hearts made of? And I’ve also got one but in popcorn so maybe you could try that one or the strawberry (or bubblegum ) flavour because I imagine that tastes very good! It’s nice, but could be nicer if you know what I mean! It tastes good but it could taste better as well!